The Whitford Corporation was founded in 1969 by two friends and business associates based in America. They very soon developed PTFE based products and launched Xylan® 1010 early in March 1969, the primary and specific purpose of the material was to provide very low friction and having the ability to apply to temperature sensitive materials, such as forged aluminium or tempered steel without re-annealing the component, or to many polymeric components without any thermal degradation or distortion.. From this first material design, there followed many other coatings within the Xylan range of coatings. 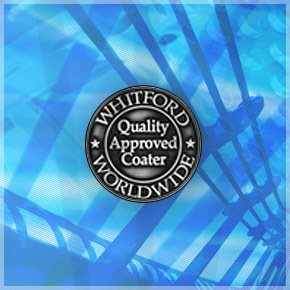 The scope of fluoropolymer coating systems available from Whitford Ltd have the ability to cover a range of product applications, from consumer products through to high value engineered parts. Idustrial applications fall into three main categories:Xylan® (organic), Xylar® (inorganic) and Dykor® (powder). Each performance coating has a part to play in most engineering disciplines. The choice of Xylan® coating depends upon determining the engineering problem (wear, heat, corrosion etc.) and matching this with the Xylan material that most effectively solves the problem. Whitford Ltd continue to develop other materials to compete in the ever changing world of both engineering and environmental disciplines. Today’s fluoropolymer coating systems are the result of design engineering carried out decades ago. With the ever present issue of the “Green Movement”, Whitford Ltd continue to develop materials that can contribute to reducing the effects upon our environment. Whitford Ltd have taken high-performance fluoropolymer coatings that have remarkable low-friction and dry-lubrication properties and combined them with the newest high temperature organic polymers to provide a unique combination of performance coatings. As well as the previous mentioned products, other primary trade names are: Excalibur®, Eclipse® and Quantum2®.